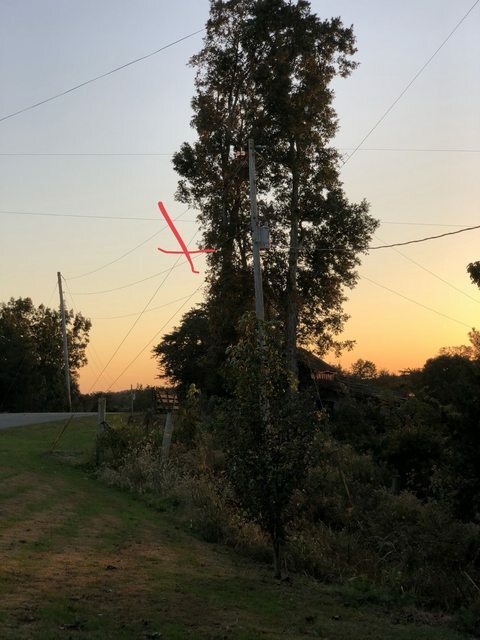 My G5RV/dipole placement - recipe for disaster, or worse? Or "okay"? Discussion in 'Antennas, Feedlines, Towers & Rotors' started by KV4JW, Oct 24, 2018. For the past month I've racked my brain about what I'm going to do for a HF antenna. I was deadset on building a fan dipole, and then I built a G5RV Jr, and now I'm going to build a full size (102') G5RV and attempt to put it at my home without electrocuting myself or falling off the roof. I spent some time measuring this evening and looking around, and taking some pictures. While I personally am confident in my ability to install a G5RV in the area I'm about to describe, I wouldn't consider it the "safest" option - however I also wouldn't consider any of my other options particularly safe or able to be accomplished without substantial difficulty or money spent either. To begin with, I'm thinking this. A 3' rooftop antenna tripod (those made for TV antennas and mini-dishes) and a length of 2" mast pipe sticking up from it. I'm estimating 5-6' of additional mastpipe above the 3' tripod. Say, 9' off the surface of the roof. The roof peak is about 14' above ground surface, for a total, of say, approximately 23'. I know this isn't very high, but I really feel like it's going to be about as high as I can do for right now. Don't flame me, just understand. It is what it is. So here's a picture of what I'm envisioning (I was too lazy to photoshop this, sorry.) 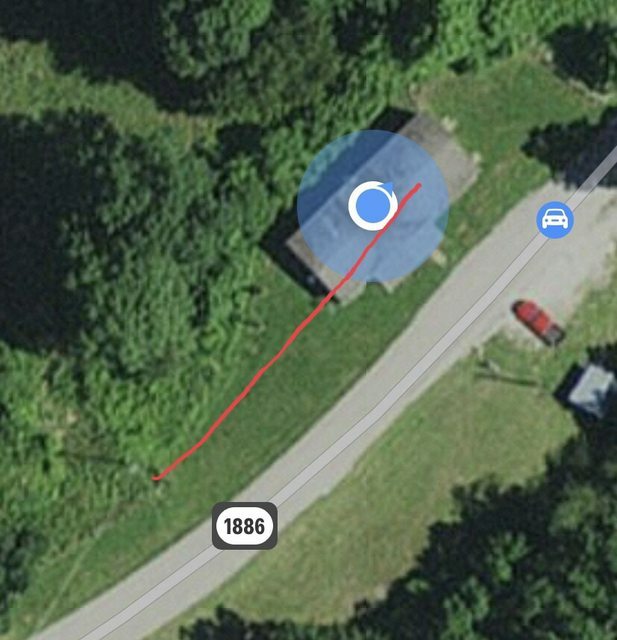 With some of one leg of the G5RV being over my roof, that should put the 450 ohm ladder line feed drop pretty close to the end of my house there. That's good for me, because my shack is on that end of the house as well. Coax run would be fairly short right up through the floor. Probably 40' or less. Looks okay, right? Here's where things are going to get a little iffy.. When you turn around and look in the direction the wire will actually be running, you're greeted with this. That's an electric pole with a nice transformer on top of it. There's guy wires for the pole, another pole in the foreground with the telephone drop line on it, and several more lines as you can see. There's really not a lot of RF noise floating around in here though, as I've spent some time out there walking around with my pocket shortwave radio at different times of day/night. If the transformer is noisy, I'm not picking up on it. For reference - years ago, I had a G5RV junior in about the same area here and it seemed to do okay. See that little pink mark? That's where I'm heavily considering tieing the other end of the G5RV to. No, it's not in the tree located in the background. It's actually.. Here. Yep - the upper guy on that utility pole. The mark is approximately where I'd need the rope to be. If you didn't think I was an idiot before, you must now, right? I know, I know. I don't like the idea either, but it's one of only a couple options I have here. My plan here is to tie off a section of UV resistant black dacron, to the end insulator on the G5RV. This would ideally put the business end of the G5RV a length away from the guy. I'd probably stick in an extra ceramic dog bone insulator just for good measure here. Or, my other option is to do something with the fence post that's beside the guys. You can also get a better picture of the guy I want to latch onto here. Here is a satellite view of my property and a pretty close depiction of where the G5RV would be ran. I feel good about the roof tripod idea and using some of the length of my house to help negate how much real estate the G5RV is taking up. I kinda don't feel good about the other end of the G5RV being within a relatively close proximity to utility lines, and I'm even more on the fence about tieing off to that guy. Not because it isn't a solid guy, because it is, very. This pole and associated guys have been here for the better part of twenty years (maybe more?) and in the ten years I've owned this property, I've never known of any lineman to ever be over there servicing anything. Furthermore, it's beside the yard, so I'm certain any service would be performed with a bucket-truck, and even if the pole were to be climbed, the G5RV wouldn't be in the way of anything. I actually considered climbing a ladder up the pole and tieing off the G5RV from the actual utility pole itself. My father, who is an ex-lineman seemed to concur with my thoughts. I shouldn't have any issues tieing to a well established guy, but with safety in mind, it's always best to avoid utility lines and service like the plague with antennas. One last tidbit, I'm curious about what all of the close proximity wires are going to do with the actual radiation pattern of my antenna? I mean, since I'm going to be close to the ground, I'm going to have a cloud-burner anyway, so would it even matter at this point/elevation? Again, my old G5RV Jr was even lower. Less than 20' above the ground. It wasn't optimal, but it got me on the air. What would you do? Proceed with caution? Tie off on the utility pole? Clobber up some sort of mast and mount it to the fence post? Or scrap the idea, do something else, and relinquish my newly earned Extra licence for even considering something so stupid? I'd install a taller mast at the peak of the roof of the house and make the G5RV an inverted vee, which brings the two ends much closer together so you can avoid the power lines entirely. A mast supporting an inverted vee is less strained than one supporting the end of a horizontal dipole which only pulls in one direction, and an inverted vee has some vertical radiation component (off the ends) with a lower radiation angle than it has horizontally to its broadsides. NH7RO, KB0MNM and WB5YUZ like this. Something like this, then? 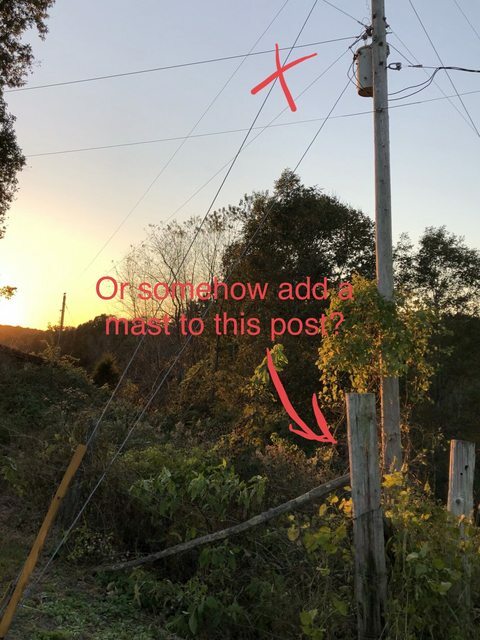 Unsure where the ends of the wires would end up being in the yard, I’d need to calculate mast height needed to get the ends approximately where I wanted them. Then you could have a 20ft pole . . . 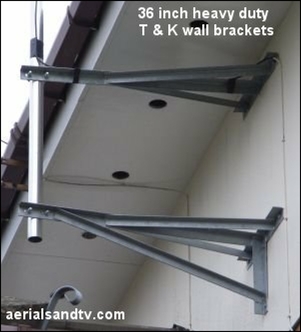 Personally, I've always used TV Antenna guys to put up my masts on buildings . 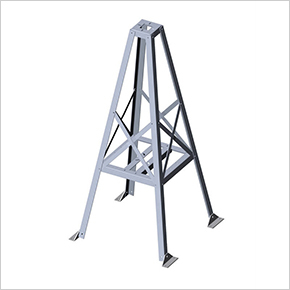 . . they don't charge much, and they are used to getting up on roofs and have all the tools and brackets ! I'm thinking the inverted V over the roof isn't going to be that bad of an idea. 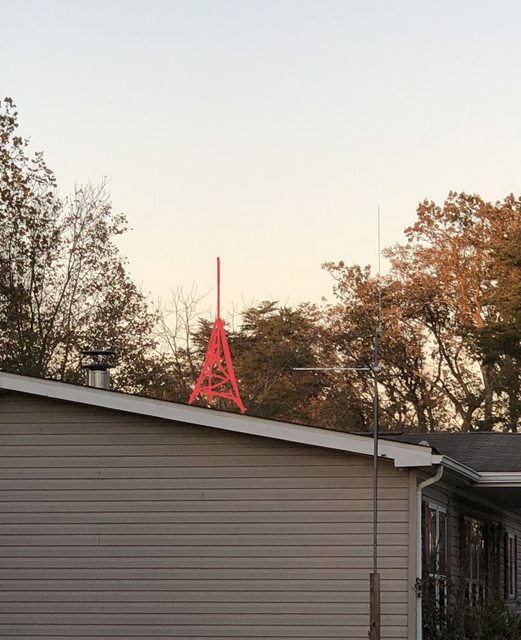 I mean, I'm putting a tripod and mast up there anyway.. Might as well just make the mast longer, move the whole antenna over the roof, and not worry about monkeying with that utility guy wire. That's also going to get the G5RV's center insulator up higher, helping to extend the 450 ohm feed better. As a bonus, the tied off legs of the G5RV should work as guy wires for the taller mast/tripod, though I'll likely guy the assembly on the roof anyway for some added stability unless it's advisable that I don't. Getting the antenna higher is always a good idea until you're up 120' above ground or so, which you won't be. 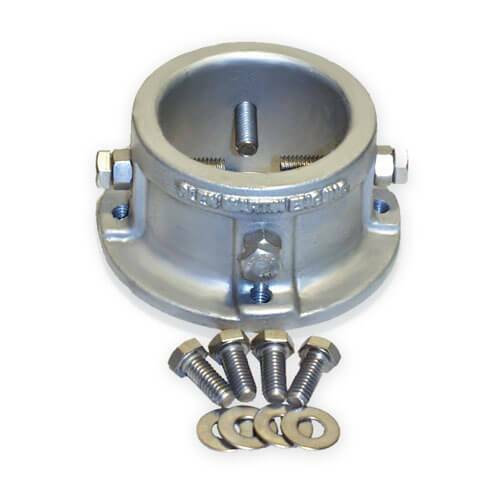 This will not only improve antenna performance but get you farther away from stuff in the house that can cause or receive interference. ...then you can easily use a 20' mast in it. About 4 feet of mast is "used up" inside the quadpod, so with a 20' mast you have about a 16' extension above and that gets the feedpoint for an inverted vee up 20' above the peak of the roof. Now, you have some real height and distance from RFI-creating stuff in the house below. And it's strong enough to "tilt up" or down with the mast and antenna already on it -- an easy one-man operation without help. 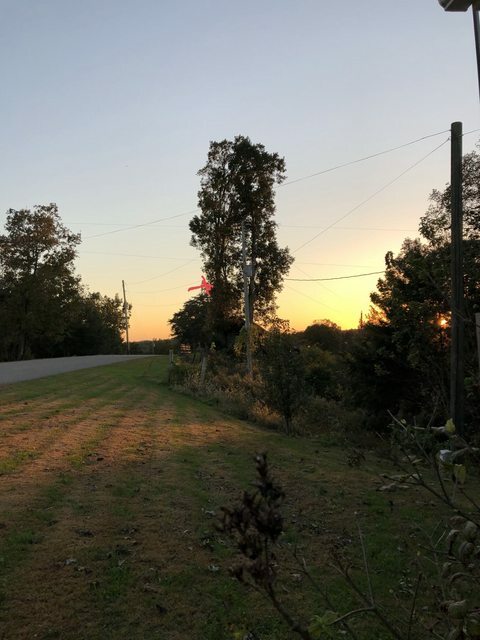 A 102' long G5RV with a few feet of rope at each end (overall installation 108' or so) installed as an inverted vee with the apex up 20' and a 90 degree included angle between the legs requires 76 feet of horizontal space for installation. Thank you for the measurement calculation. Saved me some work. Are you calculating the apex at 20' AGL, or 20' above my calculated roof line measurement? I'd love a HD quad-pod like that, but the roof tripod I have now is free vs $460 for that model on Amazon. That thing looks like a hoss though! Free is good, even if I have to invest a little money guying it. I think I have some 1/8" steel cable laying around too, so I'll just need minimal hardware. The hardware on the tripod I have is also kind of small, so I may take a little time to beef that up too and put thread locker on everything. An ounce of prevention..
Calc based on wire lengths at 20' above the roof. Do NOT use "wire" guys on a mast supporting an inverted vee!! If you need to guy the mast, use non-conductors like rope. Thank you for that advice. I'll use some dacron UV resistant rope then. If you are planning on using one band more that the others supported by your G5RV, you can trim the ladder line a bit for your desired frequency. Then you only need a tuner for the lesser used frequencies.